James Joseph O’Brien, the eldest son of Peter O’Brien and Mary Ann Goward was born at Bega, NSW on February 4, 1871 (7ei059/1871). His parents were very young at the time (Peter was 23, Mary Ann was 15) and unmarried when Mary Ann fell pregnant. At the time of marriage on October 2, 1870 (1870/2194), Peter was listed a “Labourer” at Tantawangalo, and Mary Ann was listed as a “Dairy Maid” at Lithgow Flat. John O’Brien was born April 13, 1873 at Ryans Swamp, Candelo NSW. Luke O’Brien was born 1876 at Bega and died 1879 at Bega. Patrick O’Brien was born in 1878 at Bega and died in 1900 at Candelo. William Albert O’Brien was born February 25, 1880 at Merimbula, NSW. Elizabeth Catherine O’Brien was born 1881 at Bega. Thomas O’Brien was born 1883 at Bega and died 1887 at Bega. George Henry O’Brien was born 1888 at Bega NSW. Charles Herbert O’Brien was born 1891 at Candelo, NSW. Ethel M O’Brien was born in 1885. Mary Ann O’Brien was born 1874 in Bega. On Saturday 20 July 1872, the local newspaper reported his father, Peter was on a list of people undergoing insolvency proceedings. A local newspaper of Saturday 26 February 1876 also reported his father, Peter was charged with using insulting language, to and assaulting Mr M.C.Solomon, at Candelo. The Bega Gazette and Eden District or Southern Coast Advertiser Wednesday 26 July 1882 reports his father, Peter O’Brien charged by Senior Constable Smythe with using obscene language. The Bega Gazette and Eden District or Southern Coast Advertiser Thursday 25 June 1874 reported his father Peter was in dispute over money owed him. There are further full-length reports on the links above to Peter’s own personal story. Wyndham (1894) where his father, Peter was recorded on the Electoral Roll as a Dairyman. In 1895, aged twenty-four, James married twenty-one year old Lena Noonan (717/1895). Lena, who was born “Ellen Noonan” at Araluen on January 3, 1876 (8810/1876) was the daughter of Irish immigrants, John Noonan and Hannah Lynch. Matthew James O’Brien (known as Robert or Bob) was born at Candelo, NSW on September 8, 1896 (2309/1896). Elizabeth Jane O’Brien (known as Bib and Betty) was born at Candelo on August 28, 1900 (30430/1900). Norman Leslie O’Brien (known as Sandy) was born at Bega in 1901 (20111/1902). Henry Augustus O’Brien was born at Wolumla on June 5, 1905 (20967/1905). Mary Beatrice O’Brien (known as Meg) was born at Candelo (I think) in about 1908. The Southern Star (Bega, NSW : 1900 – 1923), Saturday 1 December 1906, page 4 reported James’ appearance in court along with Joseph Noonan (presumably his brother-in-law) on using obscene language in public. At the police court yesterday before Messrs Hawkins, P.M., A. Nickle and J. Jackson, JPs, Charlie Glass was fined 1os and 6s costs for assaulting Henry Higgins on October 20. Constable Ivory deposed to seeing the assault, and laying the information. James O’Brien was charged with using obscene language in Bega street on the morning of November 11. He pleaded not guilty, and was defended by Mr. Curtis. Constable Turner deposed to being attracted to the Bridge lane after midnight on the 1oth by a row which could be heard all over the town ; he stood by the roadside, and heard defendant use the words complained of. By Mr. Curtis : Was in Gipps street when I first heard the noise ; there were five men there ; was sure defendant was the right man ; did not know who the two were who cleared out; he was not making fish of one, and flesh of another; they were all under the influence of liquor ; did not know whether there were two horses or one in the buggy. James Sirl deposed to having been in bed, and hearing bad language on the road. Defendant denied using the language ; there were six of them altogether ; he was holding the horses when the Constable arrived ; asked him what charge he had against me, and be would not say. By Sergeant Scott: Had two whiskies and three beers that night, but was not drunk (laughter) ; used no bad language ; Noonan wanted to fight ; am sober now ; had two drinks this morning. Mr. T. J. Bateman, J.P., of Numbugga, whom accused works for, gave him a good character, and said he had never heard him use a bad word. The Bench were unanimous in convicting defendant, and fined him 5s and 6s costs. Joseph Noonan was charged with using indecent language on the same occasion, and pleaded not guilty, being defended by Mr. Curtis. The constable’s evidence was similar to the former case. Defendant denied using the words complained of, although he may have used other words ; he was half-drunk. The P.M. : Which half — the head or the legs? Witness said they were on their way home, and had a quarrel with two men on the road ; O’Brien had a bit of a tussle with Bourke. Jas. 0’Brien deposed that defend ant did not use the language. Larry Bourke was also called, but he stated that he was too drunk to know what was said ; he and O’Brien had a row, and he thought he got the worst of it. Mr. Bateman also gave Noonan a very good character, and addded he had never heard him use a bad word. Fined £1 and 65 4d costs. Mr. Curtis gave notice of appeal. Larry Bourke was fined 5s and 4s 4d costs for riotous conduct. A couple of years later (1908-1909) the family moved to the NSW North Coast, along with many others who I have read were relocating there due to a rabbit plague, drought conditions, and the prospect of new improved pasture grasses in the North Coast dairy industry. Lena’s brother, Matthew Noonan, also moved to the North Coast at about the same time. 1917 – Ettrick, near Kyogle. It was at Ettrick, aged 38, that Lena fell pregnant with twins, Albert Bernard and Annie (who never survived), born September 12, 1917. They continued to farm at Ettrick until the early 1920s. 1934 – 112 Casino Street South Lismore (1934) although it appears that year Lena was still living with her family (or perhaps her brother in law’s family) at Upper Mongogarie. A more permanent base came in about 1935/1936, when the family moved into a house at 21 Kyogle Street, South Lismore which remained in the O’Brien Family for the next 50 years . The Northern Star of Wednesday 22 February 1928 reports the following incident which mentions a Joseph James O’Brien and Robert O’Brien, residing at Pitt Street, North Lismore. Particulars of a fracas at North Lismore on February 4 were detailed in evidence given at Lismore Police Court on Monday, when Francis Roy Baker, on remand, was charged with unlawfully assaulting Arthur McDermott. Mr. F. D. H. Sutherland, P.M., occupied the bench. Sergt. Aspery prosecuted, and Mr. A. Masson Cottee conducted defendant’s case. Constable Wellburn, stationed at North Lismore, deposed that at 8.30 p.m. on February 4, in consequence of a message he received, he went to the corner of Pitt-street, North Lismore, where he saw a man named McDermott lying on the grass on the road. He said to McDermott “What’s wrong with you?” He noticed that McDermott’s face and head were covered with blood, and that McDermott was in an exhausted state. He took McDermott to the hospital, and the latter was admitted to that institution. In answer the cross-examination by Mr. Cottee, witness said that he knew McDermott well. ” He was a quarrel some man. Bake had come to him and complained about McDermott. When the latter was picked up after the fight he did not smell of liquor, and spoke quite rationally. McDermot had been before the court on other occasions, and had assaulted a constable and two sergeants of the police. If it came to a fight McDermott would beat Baker. The latter had shown him (witness) marks on his neck which Baker said were caused by McDermott. James Joseph O’Brien died on the weekend of June 11, 1944 (100414/1944) and was buried in an unmarked grave in the East Lismore Cemetery on Monday, June 12. The death was announced in “The Northern Star” of June 12. Mr. James O’Brien, who died in the Lismore Base Hospital yesterday was born at Wolumla (SouthCoast) 73 years ago. He married Miss Eleanor Noonan. also of the South Coast, 50 years ago. They moved to the North Coast 37 years ago, and he followed dairying interests in the Lismore, Kyogle and Casino districts. Retiring from dairying 10 years ago, he lived at Kyogle Street, South Lismore until his death. He is survived by a widow and three sons and two daughters. The sons are John and Robert (Lismore) and Henry (A.I.F. ), and daughters are Mesdames L. Brown (Brisbane) and A.Webb (Lismore). Another son, Norman, was killed in an accident on the Cawongla “Road nine years ago. Surviving brothers are Messrs.William (Wolumla), John (Camden), George (Bega) and Ted O’Brien (Lismore). Two sisters, Mrs. Geo. Hyde (Goolmangar) and Mrs. Holzhauser (Byron Bay) also survive. The funeral will move from the Roman Catholic Church, South Lismore to-day at 11 a.m. A Requiem Mass will be celebrated at 8 am. An obituary appeared in “The Northern Star” on Wednesday, June 14, 1944. MR JAMES O’BRIEN – The funeral of Mr. James O’Brien of South Lismore, moved from the Roman Catholic Church, South Lismore, on Monday, after a service conducted by Rev. Father McGrath, who also officated at the graveside. The pallbearers were M. Noonan (brother-in-law), L. Brown (son-in-law), R. O’Brien (son), L. Winkler, C. Hyde (nephew) and T. O’Brien (brother). The wreaths were carried by Mr. A Graham. James Sweeney had charge of the funeral arrangements. His death certificate states the causes of death were (anaemia??) and chronic nephritis (kidney disease). Throughout the 1940s, Lena continued to live at the house in Kyogle Street, along with her son and daughter-in-law, Albert and Bertha. A brief advertisement in Northern Star on page 8 on Thursday 21 February 1946, refers to the following “Will take in washing at 21 Kyogle Street”. Although the electoral roll states Lena continued to live at 21 Kyogle Street up until her death, her death notice indicates she was living with her son, Matthew James (known as Robert) and daughter-in-law, Eileen (nee Crummy) at Johnstone Street, North Lismore..
She died at Lismore in May 1953 (21816/1953) and is buried with her husband and son, Matthew (known as Bob) in the East Lismore Cemetery. For many years, the grave was unmarked. Recently however, some descendants have erected a plaque. I assume it’s descendants of Bob. O’BRIEN – The funeral of MRS. LENA O’BRIEN, of Johnston Street, North Lismore, and relict of the late James O’Brien, will move from St. Carthage’s Cathedral, Lismore, TODAY (FRIDAY), following a service commencing at 11 a.m. for the Roman Catholic portion of the Lismore cemetery. WILL RILEY & SON, Funeral Director. MRS. LENA O’BRIEN – Rev. Father D. Troy conducted a service in St. Carthage’s Cathedral, Lismore, yesterday morning, prior to the burial in the Lismore Roman Catholic Cemetery of Mrs. Lena O’Brien, relict of the late James O’Brien, of Johnston Street, North Lismore, who died in Lismore on Wednesday. Mrs O’Brien was buried with the remains of her husband. Father Troy also conducted the graveside service. Pallbearers were Messrs. Bob Henry and Albert O’Brien (sons), Earl and Henry O’Brien (grandsons), and Alf Webb (son-in-law), and the wreaths were carried by Messrs. Ed O’Brien (brother-in-law), Cecil and David Hyde and Kevin Collins (nephews). Will Riley & Son conducted the funeral arrangements. * Matthew James O’Brien (known as Robert or Bob) was born at Candelo, NSW on September 8, 1896 (2309/1896). He married Eileen Crummy (born on 9th October, 1904) http://www.echonews.com.au/news/northies-wanted-to-tell-their-aboriginal-stories/485757/ ) at Lismore in 1934 (14105/1934). The North Lismore Plateau, NSW Cultural Heritage Assessment provides some information about Eileen’s heritage. One such forefather was Charlie Brown (formerly Charlie Wilson – c. 1853-1924) whose partner was Topsy Davis/Brown (c. 1849-1919). Charlie Brown came to the Richmond River where he lived with an Aboriginal woman, Topsy, of Widjebul Country, in Modanville area. Charlie (also known as “Yella Charlie” because of the colour of his hair) and Topsy had several children and was living at “Booerie” in 1901. One of their daughters was Janie Brown (c. 1878-1957 – later married to Jim Crummy c. 1869-?). Janie’s oldest child, and daughter, Eileen was born at “Booerie” (in Widjebul Country), 9th October, 1904. Eileen became Mrs O’Brien, and in 1991 was living at 3 Johnston Street, North Lismore (aged 86). It is possible that Isabel Brown who was living at Goolmangar in 1915 was another daughter to Charley and Topsy. Isabel had a son, Stephen James Brown who lived at Goolmangar until he enlisted as a private in the A.I.F. 25.02.1915 (Regt No. 1154 2nd Light Horse) aged 22 years and 4 months. Stephen embarked for Australia 21.05.1917 due to a gunshot wound to the head and neck received in Palestine. Information supplied by Eileen O’Brien, Mrs Meg Timbrell, and Mr David “Huggonson” with the Donor being Mrs Robyn Howell, 1991. For further reading of “Yella Charlie,” see M. Oakes, in the story of a north coast city: LISMORE (1979), The First Inhabitants, Aborigines of the Lismore district. children, Earle (who lived at 46 Casino Street, South Lismore, who married Alma Gill and who died on November 3, 1985 at Ballina, Alma died April 17, 1979 and is buried at Goonellabah); Terrence and Kevin (who lived for many years in Crown Street, South Lismore) In the latter years of her life, his mother Lena also lived with them at Johnston Street. Eileen is listed on the electoral roll throughout the 1950s and 60s, highlighting the different laws which existed from state to state relating to Indigenous people on the electoral roles. ALLOVER LACE FOR BRIDE Somerville studios. Alma Gill wore a frock of allover lace when she married Earl O’Brien in the Holy Family Church, North Lismore. Alma is the daughter of Mr. and Mrs. L. Gill, of Buckendoon,* via Coraki, and Earl is the son of Mr. and Mrs. M. J. O’Brien, of Johnston Street, North Lismore. The bride’s frock featured long fitting sleeves, a V-neckline, with a high collar and a full skirt with a train. The shower bouquet consisted of carnations, gladioli and tuber roses. Bridesmaids were Fay Wray and Juna Deasey, wearing white lace and blue satin respectively. Best-man was Allan Speeding and groomsman, Frank Harris. After the wedding reception at the Railway Institute, South Lismore, they left for a honeymoon at Brunswick Heads. They will live in Lismore. Matthew (Bob) died at Lismore on May 6, 1968 (20437/1968). Aunty Eileen O’Brien (my nan), Widjabul Elder, was interviewed (transcriptions recorded) 12 months before passing away in 1997. Aunty Eileen stated that during her younger days in Lismore Lane, NorthLismore, late 1929, she worked alongside a young Neville Bonner and his grandmother, Ida Bell [Granny Ida] cutting paspalum grass. She also spent time helping Granny Ida make clothes from hessian bags and calico. On some weekends, she just lolled about for hours listening to Granny Ida raving on about how it was as a young girl and how traditional life was before the settlers forced her people off their traditional lands. The interview seemed so exciting and so real – it sounded and felt as though I was there, some 70 years ago, having the same discussion! Reliving the old times, Aunty Eileen’s sanguine emotions seemed very spirited – I could feel her spirit and see her eyes like a well filled up with tears. Aunty Eileen finished off the interview by saying, ‘yes son, everything was not all gloomy in Lismore Lane…there were good days and bad days.’ Aunty Eileen’s oral evidence of cutting paspalum grass is supported by documented research evidence in Neville Bonner’s biography. Neville Bonner took his place in the Senate of Canberra 15th of August 1971, becoming the first Australian Indigenous politician. Angela Burger, Neville Bonner: A Bibliography (South Melbourne: Macmillan Company, 1979), 1. For the next thirty years, Eileen continued to live at Johnston Street, before taking a place at Caroona Nursing Home in the mid 1990s. She died at Lismore on January 13, 1999, with a probate notice appearing in “The Northern Star” on March 4, 1999. O’BRIEN – EILEEN – Peacefully at Caroona Nursing Home, Lismore on January 13, 1999. Loved mother and mother-in-law of Kevin (Sth Lismore) and Violet, Earl and Alma (both dec.) and Terence and Ruth (Petrie, Qld), beloved grandmother of Kevin (Little), Tony, Veronica, Phillip, Katrina, Sandra, Greg, Mark, Kim, Paul, Sharon, Theresa, Lesley, Judy, Rosemarie, Shirley, Earl (Boy), Matthew, Simon, John and Jane, and loved great-grandmother of their children, great-great-grandmother of Dakota and William. Eileen was a long time resident of North Lismore. Aged 94 years. Relatives and friends are invited to attend her funeral to leave Our Lady Help of Christians Catholic Church, South Lismore, TOMORROW (FRIDAY, January 15), after prayers commencing at 11am for the City of Lismore Lawn Cemetery, Goonellabah. DENISE PAITSON. WILLIAM RILEY AND SON FUNERALS, AFDA Telephone 66212237. Members of the Floral Society are invited to attend her funeral. * Elizabeth Jane O’Brien (known as Bib and Betty) was born at Candelo on August 28, 1900 (30430/1900). Elizabeth married Leonard A Brown at Murwillumbah in 1921 (8419/1921). Leonard was the son of Joseph and Ellen Brown, and according to a death notice in The Courier Mail (December 29, 1927) their other children were Mrs P Bonney (Emily), Miss May Brown, of Boatharbour, and Mrs Vincent Macrossan, of Brisbane, William Owen and Arthur Gregory Brown, of Sydney, and Leonard and Frank B. Brown, of Boatharbour. Leonard Brown, of Tweed Heads, was attacked by two men in the lower Domain yesterday morning and robbed of 12s 6d and his shoes. He was treated at Sydney Hospital for cuts on the face. Pte. Leonard Aubrey Brown, of Clunes, previously reported missing, is now reported located in hospital, sick. I only met Aunty Bib just the once, at dad’s funeral. She died at Brisbane in the 1980s. I remember briefly speaking on the phone with their daughter, Lyla, after she arrived back from living in the United States. Currendina Private Hospital was located in Ewing Street, and is currently the E-Street Guest House (currently owned by friends!!). ARRIVED IN US: Mrs. J. Curtis, with 12-months old son John, who has just reached San Francisco, where she was reunited with her American husband. They will live at Louisville. Mrs. Curtis, known to Lismore as Lyla Brown, is a daughter of Mr. and Mrs. L Brown. * Norman Leslie O’Brien (known as Sandy) was born at Bega in 1901 (20111/1902). He married Florence M Spinks in Lismore in 1934 (14105/1934). In 1935, Sandy died tragically at Cawongla near Lismore. The matter was reported in “The Northern Star”. Norman Leslie O’Brien (33) received fatal injuries at Cawongla yesterday morning when he was struck on the left side of the chest by a large piece of blue metal which was blown from a quarry about 75 yards away. Workmates who were close to O’Brien when he received the slow showed commendable bvravery in dragging the injured man under shelter while five more charges exploded in the quarry. O’Brien who lived at North Lismore was a motor lorry driver under contract to the Main Roads Department. He was employed to carry metal required on the road construction work in the Cawongla district where more than than 100 men, operating two shifts are engaged. O’Brien left his home at Lismore on Sunday and commenced work with the first shift early yesterday morning. When work ceased for breakfast about 9 o’clock six charges of explosive were placed in the quarry face. O’Brien had taken a billy to the open fire to obtain boiling water and was stooping over the fireplace when the first charge exploded. “A shower of blue metal went up in the air and one piece of stone weighing about 12lbas struck O’Brien, said a workmate. “A warning was shouted but it was too late to be effective. The force of the blue metal spun O’Brien round and his head struck the ground. His extensive injuries included a fractured shoulder and a fractured arm and lacerations to the face. A party of about 14 other workmen were nearby and, ignoring the possibility of being struck by a piece of flying metal went to O’Brien’s aid. William Campbell, who was standing a few feet away from O’Brien when he was struck said the injured man was picked up and taken behind the galley. The remaining shots went off in quick succession. O’Brien was still alive when he was placed in a lorry owned by the engineer-in-charge (Mr Steel) for transport to Kyogle. on the way to Kyogle, however, O’Brien died. In addition to a widow O’Brien is survived by one child. Known as “Sandy”, O’Brien was popular with the men employed in the Cawongla district, and it was stated yesterday that following the tragedy the men had held a meeting and decided to assist the widow. Instead of taking a holiday to attend O’Brien’s funeral, the men will work their usual shift. The wages earned by the 130 men, the majority of whom are employed under the Emergency Relief Scheme, will be pooled and presented to O’Brien’s wife and child. An inquest will probably be held in Kyogle on Monday. Damages to Wife and Child. damages were apportioned to the widow and the child and an amount towards the funeral expenses of £20. The Chief Justice (Sir Frederick’ Jordan) said that the child’s poition was to be administered on behalt of the child by the Public Trustee. Evidence for plaintiff was that O’Brien was dipping tea from a fireplace at crib-time in the quarry, when ten shots were fired without adequate warning. A shower of stone fell on the spot, a large piece killing O’Brien and a smaller piece striking a man standing beside him. Plaintiff alleged that insufficient precautions were taken to ensure the safety of the men and that. after the fatality, those precautions were instituted, which showed negligence before the accldent. The defence was that every necessary precaution was taken on the day of the accident, and that O’Brien left a safe place under the hoppers to go out Into the open at a critical time, and thus contributed to the cause of his death. Lismore, on Monday night, proceeds of which were m aid ot wie wiaow family of Mr. “Sandy” O’Brien, who was accidentally killed at Cawongla quarry, attracted a record crowd. The total receipts were £49 8s and the ex penses £7 14s 4d, leaving a balance oi £41 13s 8d. Music was supplied gratuitously by the Riordan-Chittick orchestra, Jones’ “Forlana” band, Messrs. J. Casey, D. McFarlane and L. Gates. A cake, donated by Mrs. White, North Lismore, was won by Mr.Len Sharpe. a goose (donated by Mrs.
by Mrs. Williams) by Miss Norris, a cash trophy by Mrs. R. Tulk, and prizes donated by S. McLean’s Ltd. by Mesdames Waters and McMillan. Mr. Duley, on behalf _ of Mrs.
O’Brien, thanked the musicians, the”Northern Star,” Station 2XN. Lismore Greyhound Racing Club, Mr. L-es Smith, and the collectors and others who had assisted to make the effort a success. She re-married in 1946 (27785/1946), as was reported in “The Northern Star” of October 2. A blue crepe street-length frock with white accessories was worn by Mrs. Florence May O’Brien, daughter of ‘Mr. and Mrs. R. Spinks, of 49 Tweed Street, Lismore, for her wedding to James Douglas Sowter, son of Mrs. M. Sowter, of Goonengerry. They were married in St. Andrew’s Church of England, Lismore, by Archdeacon Benyon, at 7.30 on Saturday night. Given away by her father, the bride carried a bouquet of white roses and gladioli and also wore a white straw hat. She was attended by Mrs, Clare : Jones, wearing a pink crepe street-length frock with black accessories and carrying a bouquet of pink roses and gladioli. The groom was attended by Douglas Gibson. “Love Everlasting” was sung by soloist, Mrs. C. Walker, in the church. Mesdames Spinks and Sowter received guests at a reception held at the Daffodil Tea Rooms. They will make their home at Goonengerry after a honeymoon at Coolangatta. * Henry Augustus O’Brien was born at Wolumla on June 5, 1905 (20967/1905). LISMORE CASE John Joseph Green and Henry Augustus O ‘Brien were presented on ; a joint charge of having at Lismore on ; February’-21 -broken’ and entered the jewellery ; premises :’of M5cl|ael Phil lip? and stolen 12.watches,’50 bangles,; and’ 24 rings. A plea of guilty was •entered; by the accused, O’Brien, but , Green pleaded not guilty. Mr. F. J. .K’jngBlev “Newell, instructed fby}. Mr1. S..K. Hanlin, of the Crown .Solicitor’s Office^ appeared to prosecute for the Crfown.’. The accused were unrepre sented by counsel. • At the outset the; Crown Prosecutor, in- response’to’his Honour,-stated that, as the chief witness. O’Brien, was an accomplice. and. would be wanted to give, evidence, it was for the Crown to pray’ no judgment against him. His Honour : Do yon pray.no judg ment f The Cro^yn “Prosecutor : Yes. His Honour (to the accused, O’Brien) : You are released. The Crown .Prosecutor stated that the charge against the two accused was that they had broken and entered a jeweller’s shop in Uismore known as Phillips’s, in Woodlark-street, about two doors down from the Imperial Hotel. O’Brien,, who had just pleaded guilty, would be one of the main wit nesses, and he: would tell .them m% iiis movements with accused Green on the ‘night” in question. It was, however, a dangerous thing’.to convict a man on the evidence, of – an accomplico unions there were some corroborative evi dence in” support. At. the conclusion of it.he case for tli; prosecution Green made , a statemem on. oath from the witness box describ ing his movements on the night of the robbery, in which his account tal lied with his story as contained in his statement to the police. .. His’ Honour, in” his-address to the jury, pointed out that the law required a judge, to warn-the jury of , tlio dan ger of accepting ‘the’ uncorroborated evidence of a person who either ad mitted’ or was shown to have been an accomplice, and he thought it would bp unsafe to act upon O’Brien’s evi dence unless they could find some material corroboration in other evi dence which would tend to remove all doiibt from their minds as to Green’s guilt. The jury, .after. a retirement of 20 minutes, returned. a verdict of not. guilty, and” accused was discharged. Before Mr. Justice ferguson, in the Supreme Court, two young men, John Joseph Creen, and Honry Augusta O’Brien, were charged with having, at Lismore, broken and entered the jewellery premises of Michael Phillips and stolen 12 watches, 50 bangles, and 24 rings. A plea of guilty was entered by O’Brien, but Green pleaded not guilty. The Crown Prosecutor stated that as O’Brien was an accomplice, and would be wanted to give evidence, the Crown prayed that no judgment be entered against him. His Honor (to O’Brien): You are released. After evidence had been heard, His Honor said the only direct evidence against Green was that of O’Brien, who was an accomplice. It was dangerous to take the evidence of an accomplice unless corrobated by some material evldence. The Jury returned a verdict of not guilty, and accused was discharged. A few years later, aged twenty-five, he married Florence Irene Vidler, the daughter of Henry Vivien Vidler and Edith Ann Clifford at Casino in 1931 (6817/1931). On April 2, 1942 at Paddington, NSW and living at Stony Chute (near Lismore), Henry entlisted in the Australian Army (Service Number NX94276). At the rank of Private, and a member of 140 Australian General Transport, Henry was discharged on November 12, 1945. WW2 Nominal Role. At this stage, I’m unsure of what happened to Henry and Florence after this, though a report about the death of Florence’s father (in Northern Star of Saturday 29 April 1944, page 5) records them living at Stony Chute (near Nimbin). The next record of Henry is a Northern Star report of November 18, 1952 which has Henry living at the Camping Reserve, Ballina. Two men were each fined £2 in Lismore Court of Petty Ses sions yesterday for drunkenness. They were Clive Cook, 37, lab ourer, of Tuncester, and John King, 29, labourer, of Tuncester. Four other men forfeited bail of £2 when they failed to appear to face drunkenness charges. They were Benjamin Roberts, 42, labourer, of Tuncester; Donald Herron, 38, labourer of Casino; Donald Roberts, 39, labourer, of Tuncester; and Francis Baker, 59, labourer, of Crabbe’s Creek. Harry Nott, 25, labourer, of Bobrie Street, North Lismore, and Henry O’Brien, 47, labourer, of the Camping Reserve, Ballina, each forfeited bail Of 10/- when they failed to appear. I assume Florence might have returned to live with her family at Cawongla for a period of time, as the next reference I can find to them is a report in “The Northern Star” of November 3, 1952 which has her (and not Henry) being farewelled from Cawongla, and moving to Terania Creek. A farewell and presentation was tendered Mrs. H. O’Brien and family in Cawongla Hall. Flowers were presented to Mrs. O’Brien by Lenore. Hall. Mrs. K. McGuirmess was chairman and other speakers were Mesdames Young and McNellie and Mr. Leaney. Mr. W. Kay made the presentation of a dinner set. ‘ Mr. Henry O’Brien, jun, responded. Music for dancing was sup plied by Clarke’s orchestra with extras by Miss Delia Tindall. Mr. W. Tindall was M.C. A chocolate waltz was won by Miss Delia Tindall and Henry O’Brien. The O’Brien family will live at Terania Creek. TO WHOM IT MAY CONCERN We, FLORENCE IRENE O’BRIEN and HENRY JAMES O’BRIEN, of Terania Creek, hereby give notice that we in tend to take legal proceedings against any persons found trespassing on our property at Terania Creek. Dated the 15th day of March, 1954. Signed, F. I. O’Brien, Florence I. O’Brien (for H. J. O’Brien). £10 Fine for Cycle Theft A man who, according to his solicitor, was “footsore and weary and yielded to temptation”, was fined £10 in Lismore Court of Petty Sessions for stealing a bi- cycle. The man, Henry Augustus O’Brien, of Kyogle Street, South Lismore, was said to have walked from Ballina to Wardell and then taken the bicycle from near a house. “He rode the bicycle to Woodburn,” said Detective Constable J. Bernard. – “He stayed there the night with a friend and the following day he painted the bicycle and came to Lismore,” he said. Since that day, O’Brien had been riding the bicycle. On May 8, Constable Besnard said, he saw him and took the bicycle from him. Mr. Newton, who appeared for O’Brien,, said that O’Brien was a 48-year-old ex-service man who had spent a consid erable part of his service abroad. He had been wounded and suffered nervous dis orders. “He was footsore and weary after walking from Ballina and succumbed to temptation,” said Mr. Newton, The bicycle was in much better ‘condition when handed back than when he took, it.”. O’Brien was given a month to pay the fine. Henry died and was buried on September 6, 1971 (56020/1971). O’BRIEN – The funeral of MR HENRY AUGUSTUS O’BRIEN, loved husband of Mrs Florence O’Brien of Terania Creek, loved father of Henry (Qld), Maureen (Mrs Eggins, Brisbane), Doreen (Mrs Zambelli, Modanville), June (Mrs Franchi, Terania Creek), and Colleen (Byron Bay) and loved brother of Betty (Mrs Brown, Queensland), Meg (Mrs Webb, Lismore) and Mr John O’Brien (South Lismore) will leave St Carthage’s Cathedral, Lismore, TODAY (MONDAY) after a Requiem Mass commencing at 11.30am for the City of LIsmore Lawn Cemetery. WILLIAM RILEY AND SON PTY LTD Funeral Directors. Florence died on June 20, 1985. Her funeral notice in “The Northern Star” reveals some further information about their family. Co-incidentally the funeral notice was directly next to the three year “In Memoriam” notice for her brother-in-law, my dad. Betty (June) Franchi died on April 4, 2001 and is buried with her mother. * Mary Beatrice O’Brien (known as Meg) was born at Candelo (I think) in about 1908. As a baby she moved to the North Coast in about 1908 or 1909. At Lismore in 1932 (12534/1932), she married the widow, Alf Webb who had a young son, Ron from his first marriage to Muriel Rudd (she died soon after childbirth). As reported in The Northern Star, June 25, 1929. The death occurred in a private hospital in Lismore yesterday of Muriel Webb, aged 20 years, wife of Mr. A. T. Webb, junr, of North Lismore. Deceased, who was ill only a few days, was a daughter of Mr. and Mrs. L. Rudd, of Rosebank. Mrs. Webb, with her husband, came to live in Liamore from Dunoon, where she was very popular with the younger set, and was an ardent worker for tho P.A.T.S. lodge at that centre. She is survived by a widower and an infant son aged 8 months. The funeral takes place to morrow. Alf and Meg had four children: Lenore, Margaret, Faye and Warren, who all followed their parents into service with the P.M.G./Telecom/Telstra. For most of their marriage, I believe, they lived in James Street, East Lismore. Meg died at Lismore on October 15, 1998. The funeral notice appeared in The Northern Star. WEBB, MARY BEATRICE “MEG” – Peacefully at Lismore Base Hospital, October 15, 1998. Beloved wife of Alf of Parkes St, LIsmore. Dearly loved mother and mothew-in-law of Ron (dec’d) and Val (Goonellabah), Lenore and Greg Batterham (Lennox Head), Margaret and Des Plater (Narellan), Fae Hallman (Blue Knob) and Warren and Maureen (Goonellabah). Loved Granma of her 13 grandchildren and their partners and a proud great-grandmother of her 17 great-grandchildren. Aged 90 years. Friends and relatives are invited to attend Meg’s funeral service which will be held in St. Andrew’s Anglican Church, Lismore on MONDAY after a service commencing at 10.30am, thence to the City of LIsmore Lawn Cemetery, Goonellabah. “AT PEACE”. KEN RAMSAY FUNERAL DIRECTORS AAFD Phone (02) 66252545 FDA of NSW. LISMORE RSL INDOOR BOWLERS – Members of the above club are invited to attend the funeral service of their late committee member MEG WEBB as per above family notice. Mary Piccoli, hon sec. SOUTH LISMORE WOMEN’S BOWLING CLUB – Members of the above club are invited to attend the funeral service of their late committee member MEG WEBB as per above family notice. Uniforms please ladies. B. Conroy, hon sec. In December 2001, Alf Webb cut the cake at ABC North Coast in Lismore, commemorating 100 years since Marconi’s first radio transmission. Alf was also recognised as Bigpond’s Oldest Customer. This media release, issued by Telstra, provides some information about Meg, Alf and their family. Alf Webb was born on 10th September 1905 in the London suburb of Islington. He migrated to Australia in May 1911. He married Muriel Rudd in 1928 and they had a son Ron 1929. Muriel died soon after the birth. In 1932 Alf married Mary (Meg) O’Brien who passed away in 1998. They had four children Lenore, Margaret, Faye and Warren, who all followed their father into service with the P.M.G./Telecom/Telstra. His children have provided Alf with 14 grandchildren and 24 great grandchildren. He served in the 15th Light-Horse Regiment from 1924 to 1931. In 1940 he joined the Volunteer Army Defence Force until entering Army Signals in 1943 where he served until his discharge in June 1946. In 1942 he was in a Signals Section that wor ked Morse by Heliograph. Having been introduced into amateur radio by a cousin in 1922, Alf obtained his Amateur Radio Operators License in 1947 and today remains an active operator. During the 1954 Lismore flood he provided the only communication to the outside for telegraphs, police and councils. (Alf was a Morse code operator and still is!) He joined the P.M.G. in Lismore in 1947 as an Exempt Technicians Assistant, working in the Casino and Kyogle areas as well before being appointed to Lismore in 1948 when he qualified as a technician. The “Webb” family has contributed 15 members to the ranks of the PMG, Telecom and Telstra, providing a total of 319 years, which continues with four grandsons still with Telstra. In 1987 Alf was awarded the “Meritorious Medal” by the R.S.L., followed in 1990 by an Order of Australia Medal for service to the RSL and community. He is a Life Member of the Lismore RSL; the NSW Branch of the RSL; the RSS&AL of Australia and the Old Timers Radio Club. He is a life member of the Ballina Ex-services Homes, a member of the Ballina RSL Club and a member of the Ballina Sub-branch RSL. President of SARC in 1984 and later made a Life Member of SARC. He was Australia’s oldest active amateur, being active on air every day on Morse and voice until a few months before his death. He would have been 102 years old next September. Vale Alf Webb OAM, VK2UC, SK. * Albert Bernard O’Brien (known as Johnny) was born September 12, 1917 at Ettrick, near Kyogle in Northern NSW. His twin sister, Annie, died at or soon after birth (13582/1917). Throughout his childhood, his family lived at a number of locations, including Boorie Creek and Upper Mongogarie before finally settling at South Lismore in about 1935. A few years later, he met and married Bertha Ann Dunn (known as Betty or Toby), born at Bombala on February 7, 1922, the eldest child of Charles Henry Dunn and Bertha Rixon. They raised a family of four daughters and one son. Albert’s mother, Lena continued to live with them until closer to her death in 1953. After some years living alone with their children, Bertha’s mother, Bertha Rixon and brother, Leslie John (a wardsman at St Vincent’s Hospital) moved into the house with them in about 1959. In 1970, to make way for a weigh-bridge in Kyogle Street, the house was relocated to 195 Casino Street, South Lismore. Throughout all of this period, Johnny worked as a Plumber at the Lismore Base Hospital, however, due to ill-health, he was forced to retire medically unfit. Upon retirement, he performed some voluntary work for Meals On Wheels, but was soon diagnosed with Multiple Myeloma, a form of brain cancer. In the early hours of the morning of June 22, 1982, he suffered a stroke which caused his death. For the next two years Betty suffered increasing ill-health due to a combination of heart disease and asthma. She died from a heart-attack on November 7, 1984. The Northern Star – May 15, 1953 – O’BRIEN – The funeral of MRS. LENA O’BRIEN, of Johnston Street, North Lismore, and relict of the late James O’Brien, will move from St. Carthage’s Cathedral, Lismore, TODAY (FRIDAY), following a service commencing at 11 a.m. for the Roman Catholic portion of the Lismore cemetery. WILL RILEY & SON, Funeral Director. The Northern Star – May 16, 1953 – MRS. LENA O’BRIEN – Rev. Father D. Troy conducted a service in St. Carthage’s Cathedral, Lismore, yesterday morning, prior to the burial in the Lismore Roman Catholic Cemetery of Mrs. Lena O’Brien, relict of the late James O’Brien, of Johnston Street, North Lismore, who died in Lismore on Wednesday. Mrs O’Brien was buried with the remains of her husband. Father Troy also conducted the graveside service. Pallbearers were Messrs. Bob Henry and Albert O’Brien (sons), Earl and Henry O’Brien (grandsons), and Alf Webb (son-in-law), and the wreaths were carried by Messrs. Ed O’Brien (brother-in-law), Cecil and David Hyde and Kevin Collins (nephews). Will Riley & Son conducted the funeral arrangements. The Northern Star on Wednesday, June 14, 1944. MR JAMES O’BRIEN – The funeral of Mr. James O’Brien of South Lismore, moved from the Roman Catholic Church, South Lismore, on Monday, after a service conducted by Rev. Father McGrath, who also officated at the graveside. The pallbearers were M. Noonan (brother-in-law), L. Brown (son-in-law), R. O’Brien (son), L. Winkler, C. Hyde (nephew) and T. O’Brien (brother). The wreaths were carried by Mr. A Graham. James Sweeney had charge of the funeral arrangements. From the Northern Rivers Echo: Alf Webb, the oldest licensed amateur operator in Australia, cuts the 100 year birthday cake for radio while Martin Corben, manager of 2NR waits for a slice of the action. A verdict for plaintiff for £1226 against the Comissioner for Main Roads in a case in which Florence May 0′Brlen, 24, widow, of Lismore, claimed £2000 damages for the death of her husband, Norman Leslie O’Brien, who was killed on the Main Road, Board’s quarry near Lismore on August 12, was given at the Grafton Supreme Court last night. The damages were apportioned to the widow and the child and an amount towards the funeral expenses of £20. The Chief Justice (Sir Frederick’ Jordan) said that the child’s poition was to be administered on behalt of the child by the Public Trustee. Evidence for plaintiff was that O’Brien was dipping tea from a fireplace at crib-time in the quarry, when ten shots were fired without adequate warning. A shower of stone fell on the spot, a large piece killing O’Brien and a smaller piece striking a man standing beside him. Plaintiff alleged that insufficient precautions were taken to ensure the safety of the men and that. after the fatality, those precautions were instituted, which showed negligence before the accldent. The defence was that every necessary precaution was taken on the day of the accident, and that O’Brien left a safe place under the hoppers to go out Into the open at a critical time, and thus contributed to the cause of his death. A verdict for plaintiff for £1226 against the Comissioner for Main Roads in a case in which Florence May 0’Brlen, 24, widow, of Lismore, claimed £2000 damages for the death of her husband, Norman Leslie O’Brien, who was killed on the Main Road, Board’s quarry near Lismore on August 12, was given at the Grafton Supreme Court last night. The damages were apportioned to the widow and the child and an amount towards the funeral expenses of £20. The Chief Justice (Sir Frederick’ Jordan) said that the child’s poition was to be administered on behalt of the child by the Public Trustee. Evidence for plaintiff was that O’Brien was dipping tea from a fireplace at crib-time in the quarry, when ten shots were fired without adequate warning. A shower of stone fell on the spot, a large piece killing O’Brien and a smaller piece striking a man standing beside him. Plaintiff alleged that insufficient precautions were taken to ensure the safety of the men and that. after the fatality, those precautions were instituted, which showed negligence before the accldent. The defence was that every necessary precaution was taken on the day of the accident, and that O’Brien left a safe place under the hoppers to go out Into the open at a critical time, and thus contributed to the cause of his death. WEBB, MARY BEATRICE “MEG” – Peacefully at Lismore Base Hospital, October 15, 1998. Beloved wife of Alf of Parkes St, LIsmore. Dearly loved mother and mother-in-law of Ron (dec’d) and Val (Goonellabah), Lenore & Greg Batterham (Lennox Head), Margaret & Des Plater (Narellan), Fae Hallman (Blue Knob) and Warren and Maureen (Goonellabah). Loved Granma of her 13 grandchildren and their partners and a proud great-grandmother of her 17 great-grandchildren. Aged 90 years. Relatives and friends are invited to attend Meg’s funeral service which will be held in St. Andrew’s Anglican Church, LIsmore on MONDAY after a service commencing at 10.30am, thence to the City of Lismore Lawn Cemetery, Goonellabah. The Northern Star, September 6, 1971. O’BRIEN – The funeral of Mr HENRY AUGUSTUS O’BRIEN, loved husband of Mrs Florence O’Brien of Terania Creek, loved father of Henry (Qld), Maureen (Mrs Eggins, Brisbane), Doreen (Mrs Zambelli, Modanville), June (Mrs Franchi, Ternia Creek) and Colleen (Byron Bay), and loved brother of Betty (Mrs Brown, Qld), Megs (Mrs Webb, Lismore) and Mr John O’Brien (South Lismore) will leave St Carthages Cathedral, Lismore. TODAY (MONDAY) after a Requiem Mass commencing at 11.30am for the City of Lismore Lawn Cemetery. IN THE SUPREME COURT OF NEW SOUTH WALES PROBATE DIVISION. After 14 days from publication of this Notice on application for Probate of the Will dated May 1987 of EILEEN O’BRIEN, late of North Lismore, will be made by KEVIN JAMES O’BRIEN and TERENCE FRANCIS O’BRIEN. Creditors are required to send particulars of their claims upon the Estate to TRENCHES, Solicitors, 33 Woodlark Street, Lismore. A blue crepe street-length frock with white accessories was worn by Mrs. Florence May O’Brien, daughter of ‘Mr. and Mrs. R. Spinks, of 49 Tweed Street, Lismore, for her wedding to James Douglas Sowter, son of Mrs. M. Sowter, of Goonengerry. They were married in St. Andrew’s Church of England, Lismore, by Archdeacon Benyon, at 7.30 on Saturday night. Given away by her father, the bride carried a bouquet of white roses and gladioli and also wore a white straw hat. She was attended by Mrs Clare : Jones, wearing a pink crepe street-length frock with black accessories and carrying a bouquet of pink roses and gladioli. The groom was attended by Douglas Gibson. “Love Everlasting” was sung by soloist, Mrs. C. Walker, in the church. Mesdames Spinks and Sowter received guests at a reception held at the Daffodil Tea Rooms. They will make their home at Goonengerry after a honeymoon at Coolangatta. A report (and photograph) in The Northern Star of Wednesday 1 October 1941 mentions Pte. Leonard Aubrey Brown, of Clunes, previously reported missing, is now reported located in hospital, sick. Granny Janey Brown at North Lismore in 1935 with her grandsons. The Northern Star of October 1, 1949: The engage ment has beer announced o( Valerie Joan second daughter of Mr. and the late Mrs. Chris Undery, of War- dell, to Ronald Alfred, eldest son of Mr. Alf Webb, of Parkes Street, Lismore. Weekend Brides In Lismore (Photos by Esquire Studios) Lenore Webb had two bridesmaids when she mar- ried Greg Batterham in St. Andrew’s Church of England. Mr. and Mrs. A.. T.. E. Webb, of Parkes Street, Lis- imore, are the bride’s parents land the groom is a son of Mr. land Mrs. G. Batterham, of Alstonville. The bride wore a gown of embossed faille cut on classi- cal lines with a roll standup collar and fitting bodice offset, by a princess peak. An un- usual effect was achieved by the front panel of pleated nylon organza forming an un- derskirt to the faille redingote skirt. A full circular scalloped train fell from a nestle of pleats. A Tudor hat held the wispy tulle veil. 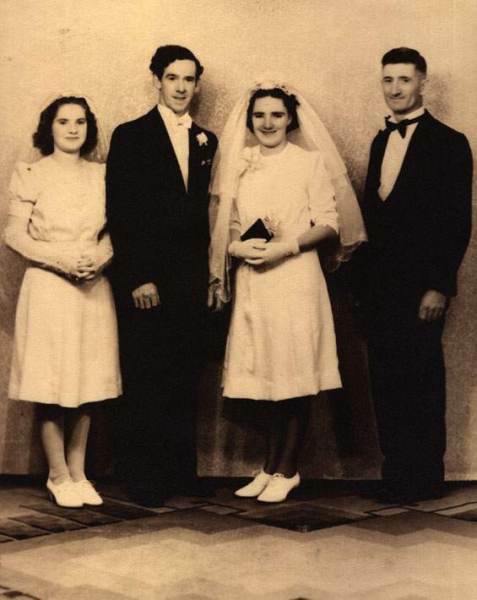 The bride car- ried a bouquet of carnations and lily of the valley, Margaret Webb and Audrey Batterham were bridesmaids and Don and Neville Batter- ham attended the groom, After a reception at the Rowing Club, the couple left for a Brisbane and Barrier Reef honeymoon. I have apologise for not keeping in touch with you over the years. Sadly, my research stagnated for a number of years, but I am now getting back in to it. I note that you have made a lot of progress in your research. I will contact you again soon. I noticed on another site, which I cannot find again, that you have had contact with Victoria Whyte (Ellen Agnes’ grand-daughter) and also Jeanette ? I will speak to you soon. We are doing a tree on our family. i am a daughter of Pearl&William Carter. relations.Could i ask for any info you may have please. My name is Florence Ann Carter,I get called Ann. FIRSTLY Dare of Death was 1999, not 1994. SECONDLY Alf O’Brien was Alf Webb. THIRDLY, just to add to was Johanna said, Jenny passed away on 9 December 2008. Hi James . after looking for many years I may have come across something. Would you know the parents of eileen. I knew her all my life but something tells me i am related to her. Hi Nola, loveyl to hear from you. Hi James , I was bought up in Nth Lismore and lived quite near Earl and Violet and remember them quite clearly. My grandmother was Catherine Crummy and I am thinking it is her brother who is the father of Eileen. One of grandma’s brothers married Polly Capeen. I will have to search for information I have put away. Great to hear from you, and great that your sister is doing some family tree stuff. I think the older we get the more interested we as humans become in this stuff. Glad that what’s here can be useful. I mostly grew up with the Dunn side of my family, and didn’t know much about the O’Brien side until I started to do some research. I knew Matthew and Simon from South Lismore, but I never knew that we were related until recently. Small world, eh? Hoping the research goes well, and hopefully we can share some further info. My grandmother was Evelyn (Vidler) Serone, a sister of your grandmother Florence (Vidler) O’Brien. I’m compiling a family tree of the Vidlers and I have photos of all of my grandmother’s siblings as adults except for Florence. (I have a photo of Florence as a child). Do you have a photo of her that you would be so kind as to share with me? Wow, a connection to the Serone family also. I hadn’t realised I was related to so many people from school. Looking for information on a Ruth E Petrie (and her descendants) DOB 1-1-1903 Chicago, Illinois. I enjoyed reading your family history. It has some parralells to my McDonald family history. They immigrated from Scotland in 1837/38. They lived, married, died and farmed in Nimmitybelle, Bega, Queanbeayan, Bombala, Bemboka and Tumut. Like the O’Briens they also moved to the Lismore area in the early 1900’s. I always wondered why. My grandmother, Mary Eileen Clifford nee McDonald remembered as a little girl travelling up the coast on a ship to I think it was Ballina. I have also other ancestors who lived and farmed in the Kyogle and Lismore arears. Their surnames are CLIFFORD, MARSDEN, MARZOL, DEAN, STARR and STAFF. Jessica [aunty Jess ] 1st Roy Deacy 2nd Speeding. Hi Christine, thanks for the info. That’s terrific. I’m a little confused, though as the NSW BDM has an Eileen Crummy (born 1905, mother Amelia, no father listed 24420/1905 at Lismore) and I couldn’t find a marriage or birth with the names mentioned. I knew the Speeding family fitted in somehow – I was in the same year at school as Peter – but wasn’t really sure how. Hi Jenny I am Rebecca granddaughter of Gloria who was daughter of Dolly and James so Bob is Gloria’s brother? I am try to track my heritage too, can see Gloria on the family tree and how can I gain information about her past. My name is Diane Smith I am Christine Nissen’s younger sister. I have been trying to get some information on the family to assist my children (Courtney Wicks (nee Everitt) Wilde Page, Baine Page and Auston Page) with their ancestry. I know about our Great Grandmother Janie and a little about our Grandmother Dolly but am not sure about our Grandfather there doesn’t seem to be much knowledge about him perhaps you can help. I have a family tree at home that i have been working on, I can send it to you guys, so that yous can connect yourselfs in. I am Eileen’s great grand daughter (well one of). I would love to see a copy of the abovementioned family tree. Would it be possible for you to email it to me? Just following up my previous comment, could you please send me a copy of the printout of the family tree done by Barry. My name is Courtney and this evening I was idly Googling my name when your site came up. My maiden name is Everitt, my mother is Diane Smith and her father Anzac Smith who originated from Lismore. The surname Crummy rings bells but my oral family history is so fragmented its hard to keep track. However, the Eileen Crummy you write about sounds similar to a great Aunt Nielee we had who had a son named Terence. Family history states that Terry was adopted by Aunty Nielee from my great grandmother Dolly (? ), and it is believed Dolly didn’t survive long after his birth. Could these women Eileen and Nielee be one and the same? Ha! It seems my mother is already on the case! It is hard to have a clear genealogy when half of your family history is blank because of race. Hi James, I found your page after googling Dolly Mabel Crummy, Dolly is my paternal great grandmother. Do you have any information on any surviving family members I can contact? I am currently tracing my aboriginal heritage and would like to find out as much as I can on top of what I know. Thanks in advance! Hi James I am Rebecca granddaughter of Gloria Elaine Smith, her mum and dad was Dolly Mable Crumbie and James Smith re the comment above. Hope you’re keeping up to date with the comments. Sounds like we’ve got a family reunion happening here! Apologies for the delay in approving these comments. I’ve been in the air for what seems like an eternity. If you’ve commented previously, they should now be automatic. It sounds like there’s a bit of interest in the Crummy connection right now. I’ve published everything I have, but would appreciate any further comments. My own connection to Eileen (also known as other names) was through my dad. She was my dad’s sister in law. I grew up knowing a couple of the sons, and went to school with a couple of her grandsons. Hi James, my great grandmother was Elizabeth Jane O’Brien. My mum grew up with her until she was 12 years old, when her grand mother passed away. She then went to live with one of her brothers, who was adopted by her aunty. Then her and her other brother went to an orphanage. She also has an older brother who I think lived alone. His in Newcastle. You can e-mail me and I can ask my mum if you like. She has many photo’s. She recently reunited with her brother after 50 years, and my cousin John has supplied her with the photo’s. John is a bit of a family history buff. His e-mail is john.obrien.aus@gmail.com. I should add that my mother is the daughter of Dolly and Jim. She lived with Janey when she was young because Dolly died when my mum was around 2. Great to hear from you. Wow! I only met her once, at my dad’s funeral in 1981, and then it was only briefly. I do remember dad was very fond of her, and he used to call her “Bib” as I recall. I also remember being amazed at how much she and dad looked alike. When I was growing up, I didn’t know dad’s family all that well as I knew my mum’s, so it was great to hear from you. I would love to know more, and would love to see any family photographs. In the last few weeks this part of my family’s extended story is really starting to open up and it’s very exciting. I’ll drop you a note. UPDATE – After seeing Mark’s comment below, I realised I’d confused the two women called Elizabeth Brown. Hi James, I had a quick chat with my mum. From what I understand Elizabeth Jane was initially a Brown, then she married a Crummy. They had Eileen, Mabel (Dolly), Jesse, and Charles. My mum is the daughter of Mabel. Mabel married and became a Smith and had a number of Children such as my mum, Roy, John and Terry (others as well). Eileen married and became an O’Brien, she adopted Terry and his name changed from Terry Smith to Terry O’Brien. I could be mistaken, but I am not sure if the Elizabeth Jane O’Brien who became Elizabeth Jane Brown is the same Elizabeth Jane Brown I am speaking about. My mum said the Elizabeth Jane Brown she is speaking about had a maiden name of Brown then became a Crummy. She died around 55 years ago when my mum was 12. They lived in the same tin shed at the back of Eileen’s property together. After Jayne died, my mum lived with Eileen for about 12 months before she went into an orphanage. Roy, Terry and my Mum are still alive. John sadly passed away a number of years ago now. My mum and John lived together with Eileen for a period of time. I am not sure exactly how long John stayed with Eileen for. I was confusing the two, Mark, but still there’s a connection there. Lots of other people also chasing this part of the tree at the moment. Wrong Kevin… The Kevin Latoya is referring to is Kevin James’ (Eileen’s son – or Kevin Snr’s) oldest son (Kevin Jnr). Confusing, I know! My name is Christine Speeding. How do the Speeding’s fit into your Family. family I would love to hear from you. Thanks Christine. Hi James, My name is Alison I am one of Kevin James O’Briens granddaughters. Just wanted to let you know reading your page has been wonderfully enlightening. Obviously I never knew my great grandfather but remember my Grandmama Eileen very fondly. Thank you so much. james our family are planning a reunion the family includes the descendants of janey crummy nee brown her children my gran mabel dolly smith ,aunty jess and aunty nile obrien if any one is interested feel free to contact jenny smith in lismore we are hoping to get together in the june long weekend of this year . thanks christine. wow am i putting a lot on jenny well she lives up there so here goes . Good luck with it all. I helped organise a school reunion a few years. It’s a big job, but well and truly worth it. Just found this site I am the daughter of Robert Leslie Spinks from Lismore who is the Grandson of The Spink”s Norman (Sandy) lived with, His Aunt Is Florence Spinks. Great to hear from you. I guess that makes us distantly related in some way. My father is the unknown son of Sandy dad got to meet his brother Ray in 1997 with myself and family, we all went to his sons wedding. Dad got to know his brother in the last years of Rays life and spent time with him. It was my mum who discovered this and unfortunately mum died September 1996 and never got to meet Ray. Hi James just wanted to let you know that my father Robert Leslie Spinks passed away on the 26th of November 2015. I’m sorry to hear that. Best wishes to you and your family. Hi Christine, Latoya and others, was searching and found this article with a photo of Eileen’s mother, Janey. Hi Christine, that’s great. Which ones are Earle and Kevin O’Brien? Hi James and Christine, I am Gloria Elain Smith’s daughter in law, she was Mabel Dolly Smith’s daughter, Eileen’s sister. Can you direct me to the Smith Family Re-Union Page please. Also on reading this again Rebecca Waite-Pullan who is my daughter and granddaughter of Gloria Elain Smith has already been on here, she and I are attempting to do a family tree. We found some messages from Eileen for Topsy on the AITSIC Aboriginal stories website and some stories about Janey and Charlie and some mention of a possible parents of Topsy being Piggy and Kitty Nerang?????? Is this true. Also if you do have the family tree from Jenny Smith a cousin can you forward it to my address please. Gloria passed in 5th Jun 1984 from complications of diabetes and congenital heart disease. It was a very sad day, Rebecca was born 1st of Jun 1984, Gloria sang a song to Rebecca;s photo before she died but never got to hold her. Wonderful exchange of information. I have been following the O’Brien family from near Pambula and Bega. They are connected to my HYDE/SHIPWAY and therefore McQUILTY. I have done extensive work on the McQUILTY line on the North Coast and that includes some koori connections. I also believe that any research I do is to be shared so anyone looking for extras from this post is welcome to contact me.